(11 December, 2018), A protest in the interim capital of Aden to demand to reveal the killers of Rawi Alariqi, Imam of Ibn Alqayyim mosque and bringing them to justice. (11 December, 2018), Local source: 5 civilians were killed and others injured in a tribal revenge in Qanya area in Baydha governorate. 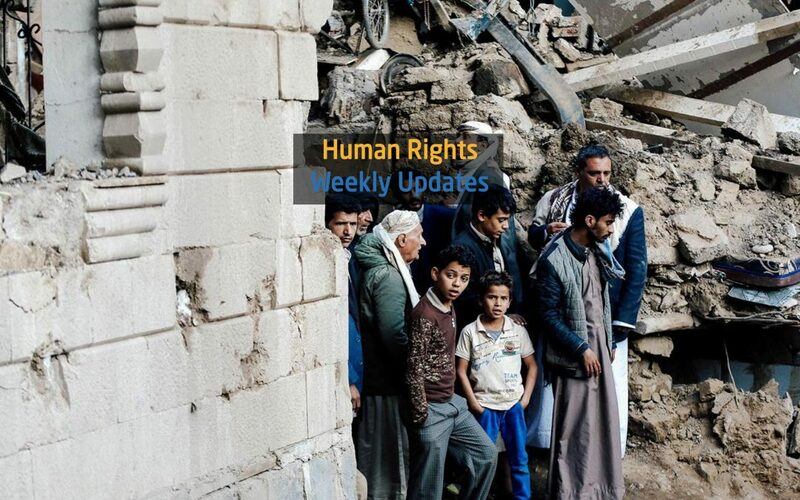 (13 December, 2018), Human rights activists reported the abduction of two civilians in Sana’a. The Houthis have abducted an employee of the Water Ministry, Abdul Karim Aleryani, and the manager of the Alsteen branch of CAC Bank, Ghassan Abu Ghan. (14 December, 2018), A family lives under an old truck parked for years and lacks the basic needs. They lost their house in Sabr district at the beginning of the war and received no aid. (15 December, 2018), The Yemeni National Committee on Investigation of Allegations of Human Rights Violations documented 5,572 cases of human rights violations this year. (16 December, 2018), Houthi militia targeted with artillery a number of civilian houses in Almanthar neighborhood in Hodeida city. They completely destroyed them and forced the civilians to leave their homes. (16 December, 2018), Safe drinking water is scarce in Soun village in Aldhlea governorate as a result of the water reservoirs and underground wells being destroyed and the siege imposed by the Houthi militia. (17 December, 2018), A 5-year-old child, Zainab Jameel, was killed and her brother Abdulhadi was injured today by a sniper’s bullet in Alsarmeen village east of Taiz city.